The flavours of Thailand are captured in this recipe combining coconut and the spices from the green curry paste creating a fresh vibrant salad experience. Whisk the KNORR Coconut Milk Powder and water together. Mix the prepared coconut milk with KNORR Thai Green Curry Paste, palm sugar, fish sauce, lime leaf, peppercorns, coriander root and KNORR Garlic Puree. Poach the chicken breast in prepared coconut milk mixture. Remove from heat and cool. Shred or slice chicken. Strain the coconut milk mixture; reserve for dressing. 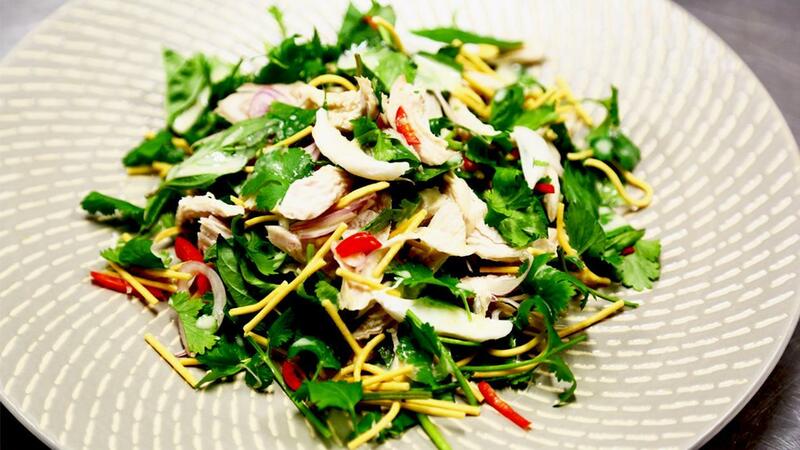 To make salad, toss noodles, coriander, basil, chilli, wombok, leaf mix and chicken together. Serve drizzled with reserved coconut milk mixture.